Onboard your users with a Progress Bar. Most of us aren’t that lucky. As a matter of fact, asking our users to do something, sometimes has the opposite effect! There is a usability feature called a completeness meter that is employed by companies like Google, LinkedIn, and Box. These types of progress bars inform users of how close they are to completing a set of tasks by showing percentages of completion along the way. You can read the full article on their blog. 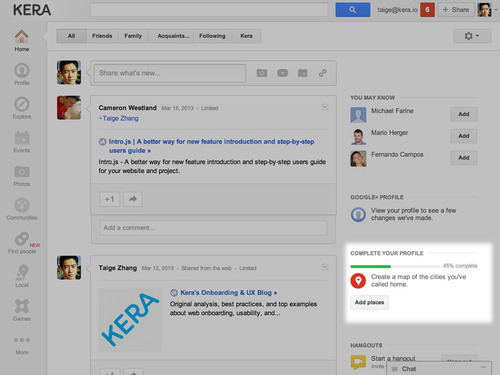 Earlier this month, Google rolled out a progress bar for their prized social network platform Google Plus. It caught our attention. We believe in the power of progress bars and was happily surprised to see its implementation by Google. The completion meter (a type of progress bar) is positioned in the lower right hand of the page. This position is optimal because it’s not vital information but important enough that your users will see it (and hopefully get to it). 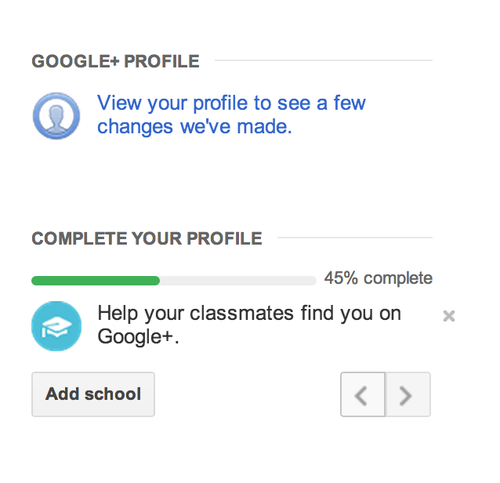 Google Plus named its completion meter “Complete Your Profile” which gives meaning to the progress bar and also issues a firm command. It shows percentage of profile completed. 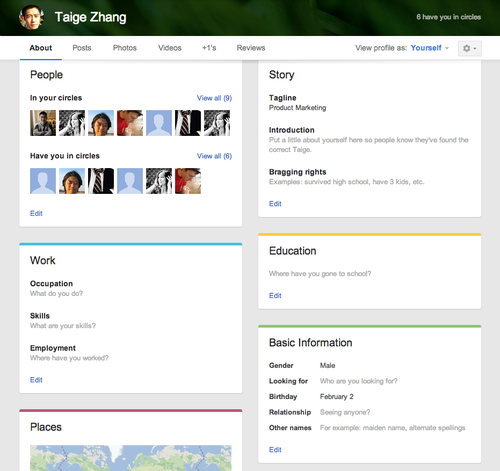 It also presents a single task you can do to boost your profile. In this case, it’s adding a school. There are two arrows that allow you to do another task if you don’t want to add a school. This is a great affordance because as a user, if I really don’t want to add a school, then I’ll be forever stuck. This is akin to presenting multiple missions in a game that gives the user freedom to choose. However, due to space constraints, they are not shown, unless the arrows are clicked. If you click on the X, the progress bar will be removed from your profile forever! I am not sure how to get the progress bar back. It’s interesting companies like Box and Google choose to allow users to remove the progress bar (and making it impossible to undo), while companies like OKCupid and LinkedIn make the progress bar perpetual. I can understand progress bars can cause stress and tension for the user which is why they allow users to remove them but users also want to find out about cool features and get the most out of the app. What happens when I want to have it back? There should definitely be a way to get back on track. 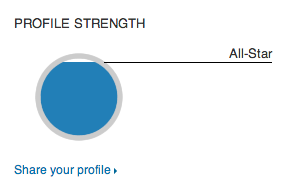 LinkedIn’s Profile Strength Indicator persists even after you reach 100%; while some companies such as Dropbox and 7Geese remove their progress bars after users have onboarded. This makes sense once you’re onboarded, there’s no need to provide you with missions anymore. The progress bar is the cocoon of a butterfly. However, in the case of games additional value may be provided by releasing new missions. Some games have a notification centre that can be inbox-zero but you will see a badge every time a new mission is available. We’re all used to that because Facebook does the same thing to get us to check messages which are game-like in that they can be to-do items. Like missions. In the case of onboard-once web apps, perhaps there are no plans for future missions so there’s no reason to condition the user to associate that part of the UI with new missions. Perhaps the need to add missions without retracting progress is why LinkedIn changed from a completion meter to a profile strength badge. Or maybe it was a design choice or based on research people preferred filling out a circle better than a bar or it was more fun to give ranks. Maybe it’s a combination but my hunch is that LinkedIn wants to introduce new missions. 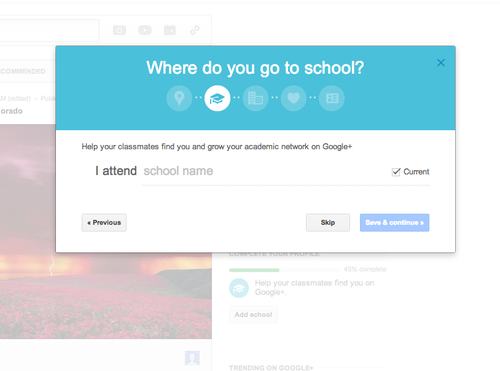 If you choose to accept a mission, in this case, add a school, you’ll see a modal that helps you complete your profile. This makes it a lot easier, seamless, and more fun than taking you to a standard page where you could provide the information. This is the standard edit profile page it doesn’t take you to. This is excellent because once you get started with filling out your school. You’re in the filling-out-stuff state. What better time to give you more similar, uncompleted tasks? Google would love to get you to complete all that information. Like Tetris, Google loads it on. I’m curious what results Google achieved with this. Did they boost the percentage of people with complete profiles? Did they get more info per user? Did they get it faster? I’d love it if Google could share some stats on this. I’ve reached out to them and am waiting to hear back. Facebook is also doing something cool to get users to do stuff. Not onboarding but worth reading if you’re interested in product and UX design. Subscribe to this blog and follow us on Twitter to get more onboarding and UX news. Note: This section will be updated if I get feedback on Google’s results.